As with literally every Soap and Glory product, the packaging is gorgeous. Simple, pink, and very recognisable. The packaging is sturdy, and includes a pump for generous applications. I, for one, am a lover of pumps for moisturisers. There’s nothing worse than a slippery lid, or one covered in questionable moisturiser left from months ago. It keeps it all clean and tidy, and makes it much less of a faff. My favourite thing about the product is the scent. A combination of almond, oat and brown sugar makes it smell absolutely incredible. And I am not exaggerating even a bit. 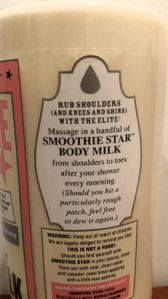 It’s particularly good paired with S&G’s Breakfast Scrub in a lovely relaxing shower. Something I find with shower gels and moisturisers is that a lot of the time, the scent doesn’t linger too long – but this definitely does. I’ll find that I catch a whiff of the scent in the evening after using it first thing in the morning. As for moisturising, the lotion itself is of very good quality. It’s light enough to not be as indulgent and time-consuming as body butter but offers the same level of moisture. It’s very creamy, and takes a few minutes to sink into your skin, but leaves your skin feeling freshly moisturised all day. As I’ve said before, I am super lazy, and it is a little more time consuming than the Vaseline Spray Moisturiser, but it is something I would gladly spend a little more time on. My skin is fairly normal, with a few dry patches on my legs and arms. After using this, it leaves my skin noticeably smoother and feels a lot more nourished. I cannot sing my praises for this product loudly enough. I’d definitely recommend this to anyone that’s looking for a good moisturiser to use regularly. It’s currently a fairly reasonable £10 in Boots, and comes in a 500ml bottle that lasts me easily around 3 months, using it on average 3 times a week. S&G is currently 3 for 2 in Boots, so it’s a great time to TREAT YO’ SELF.